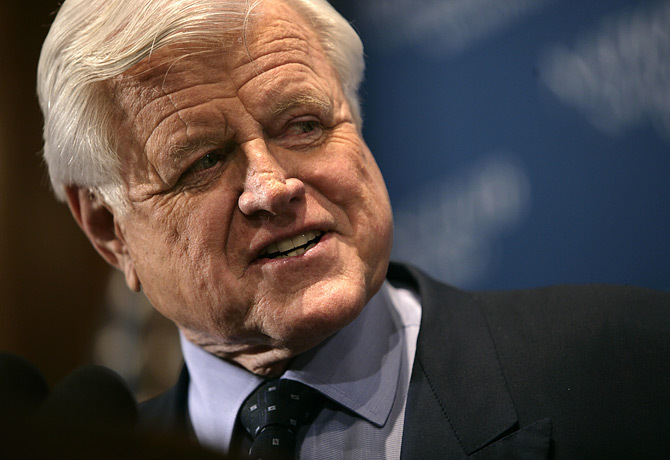 Senator Ted Kennedy suffered a massive seizure, which lasted for sometime, during the luncheon celebrating the inauguration of President Barack Obama. He was seated with former Presidential hopeful Walter Mondale and Senator Robert Byrd, who has also suffered an emergency health situation. According to eyewitnesses, the seizure was quite violent and it lasted well after he was placed into a wheelchair. Theresa Kerry, Senator John Kerry’s wife, attempted to assist Sen. Kennedy just before paramedics arrived. Sen. Kennedy was then moved from the building in a stretcher. According to Sen. Rockefeller, as the seizure occured, silence was called, the lights were dimmed, and President Obama went to Sen. Kennedy’s side immediately. 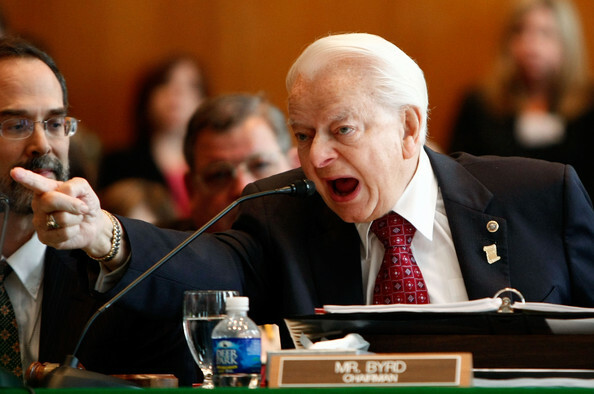 As mentioned, Sen. Byrd also suffered a health situation, though it is not yet clear what has happened. He was attended to by paramedics. 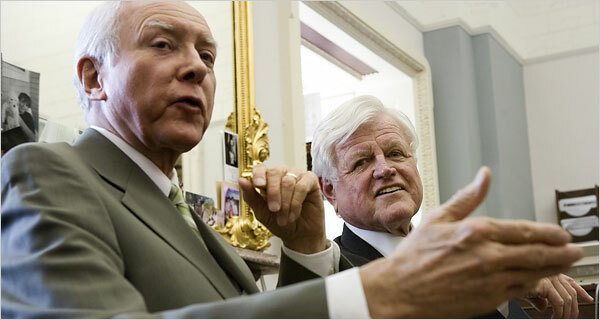 Just a few moments later, Sen. Kennedy suffered a seizure. CNN’s Sanjay Gupta reported that Sen. Kennedy would most likely have his medication level checked and receive another brain scan in order to compare it to previous scans. Sanjay Gupta is also someone who might have a role in the incoming administration as Surgeon General. I woke up at 8:00 this morning. I jumped up and tried to get my wife up and awake. We do not have cable, so we had to go to her parents house to watch the inauguration, which was to start in half an hour. I threw on a Barack Obama shirt I bought specifically for this day, out on a quartet of Obama buttons, brushed my hair and teeth (with different brushes), and ran out the door, wife in tow. Before I drove off, I made sure my bumper sticker was still attached: January 20th, 2009. A day that will live on in infamy. 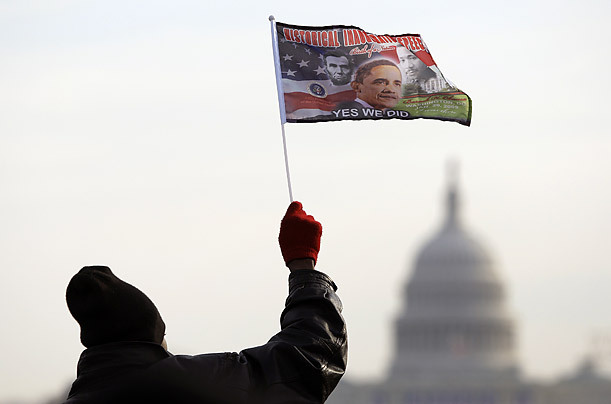 Those who have followed my blog know that I am not a huge fan of Obama. I am, however, a far bigger fan of his than McCain… or Bush. I suppose I support the evil of the lesser over the lesser of two evils. I watched the inauguration on CNN. The day apeared to be bright and clear, albeit cold (apparently 28 degrees). There were swarms of people– well over two million. I saw many famous faces and many nameless faces, but they all were beaming with pride, joy, and anticipation. I could feel myself smiling, actually. 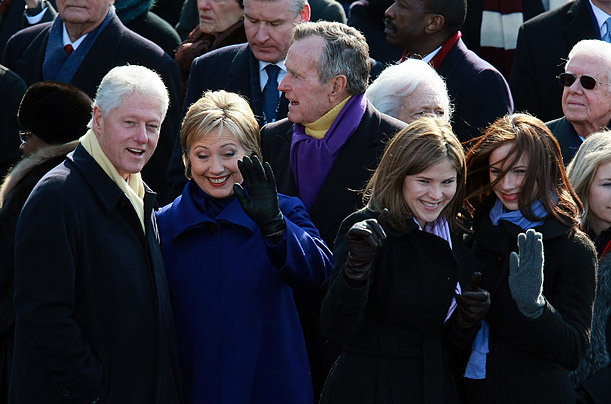 When Bush came out, to the song Hail to the Chief, I thought I would boo or grimace. I actually had no response. He seemed annoyed or depressed– or both. Nonetheless, he was gracious and kind, as he had been all throughout the transition. This was Bush’s finest moment. 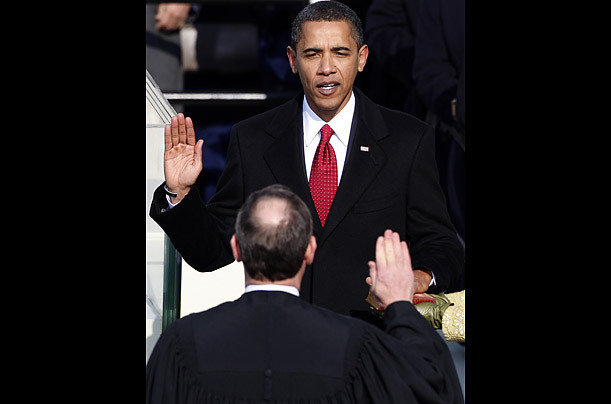 One of my favorite moments was the Oath of Office. Not only did Obama screw up the beginning of the speech, he also was tripped up by Justice Roberts’ screwing up of the Oath. 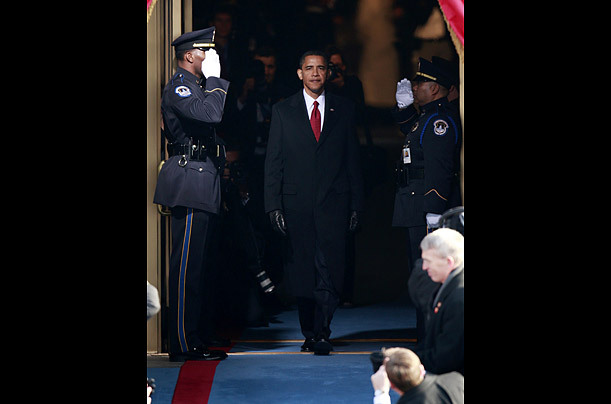 Though the Oath was delivered clumsily, it nonetheless was a moment of levity and importance. Obama’s speech, which was bold, strong, and extended a hand of peace and friendship to the world, also made reference to the plight of African Americans. His speech was full of allusions to songs and sayings from the Civil Rights movement. Though it was a great speech, I did not really feel like there was an FDR or JFK moment. I’m very happy today. Change may come gradually, or not at all. 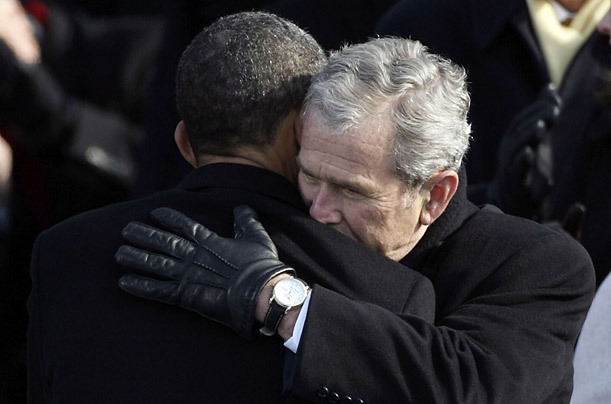 But I do sense that Obama will break with Bush’s policies over the last 8 years. I hope he is successful. I hope he does bring change. I am heartened to hear that he wants to appoint a middle-east envoy today, and that he wants to tackle the issue immediately– not just the tension over Gaza, but the overall peace process that has eluded every U.S. President. I remember very clearly, as a child, being drawn to Bill Clinton. There was something about him– his charisma, his confidence, his energy, his ability to inspire hope– that, even as a second grader, I felt demanded my admiration. I can distinctly remember seeing him on Arsenio Hall playing the saxophone. I must confess that I wanted, with all my heart, to play the saxophone, but I was stuck with the clarinet. All throughout his term, I vigorously defended him. I was even a vigorous defender during the Monica Lewinsky scandal. Hillary Clinton once famously remarked that they were the victims of a vast right-wing conspiracy, a comment for which she has since been lampooned by critics for making. I was unafraid, even around ultra-conservative-Limbaugh-die-hard adults, who were much older than me, to quip, “Yeah, there was no right-wing conspiracy. ‘Conspiracy’ implies that it was clandestine. The right-wingers have been pretty open about their attacks.” As I’ve gotten older, the more people criticize the Clintons, the more I love them. During the brutal 2008 Democratic Primary, Barack Obama was quick to down-play the significance of Bill Clinton’s presidency and the success he achieved for the economy and for world peace. I personally found these attacks on the Clinton legacy to not only be counter-productive, but also, obviously, untrue. That he could make such comments, given that we had suffered through almost two terms of President George W. Bush, seemed ridiculous. One of my favorite remarks from Hillary Clinton, during her campaign, was, “It took one Clinton to clean up after the first George Bush, it’ll take another Clinton to clean up after this one.” President Bush (41) and his predecessor Ronald Reagan had, as Greenspan conceded in his book The Age of Turbulence, “borrowed from Clinton, and Clinton was having to pay it back.” In other words, the so-called “fiscally responsible” Republicans had created such a massive deficit that it threatened to throw the American economy into a major recession– and it forced Clinton to make budget cuts in order to pay down the deficit, which forced him to delay the advances in social programs (education, health care, infrastructure, environment) that he, in his heart of hearts, wanted so badly. What amazed (and confused) Alan Greenspan (a Republican) was that the Republicans of his time were fiscally irresponsible, while this young liberal democrat named Bill Clinton was pursuing a policy of fiscal conservatism. What also shocked Greenspan, upon meeting Clinton, was Clinton’s grasp of complex and theoretical economics and his understanding of the need to cut the deficit: “Our meeting, which had been scheduled for an hour, turned into a lively discussion that went on for almost three.” He also noted that Clinton “asked a lot of smart questions that politicians don’t ask.” Greenspan wrote that Clinton was “taking a page out of Kennedy’s book,” by surrounding himself with conservative economists. In order to pursue a more fiscally responsible policy, Clinton built a team that consisted of Leon Panetta, Larry Summers, Bob Rubin, Robert Reich, Alan Binder, and several others. Rubin and Summers met regularly with Greenspan to discuss policy and develop new ideas to spur economic growth. The meetings of this team had been described by Bob Woodward in his book The Agenda. According to Woodward, there was “absolute chaos”. It was unstructured and freewheeling: “The arcana of deliberations were torture for nearly everyone but Clinton.” The book depicted a Clinton White House that was “undisciplined” and “indecisive,” but Woodward missed the point entirely. A person like Clinton, creative and thirsty for information, tended to operate outside of the box. While the policy debates would seem to the outside observer to be chaotic, they were very helpful to not only the President but to his staff, as well. Clinton’s team was comprised of people who didn’t necessarily agree with each other, which was part of the madness. He would encourage them to debate one another, which inevitably would send the meeting into “chaos” as groups of people would break off into their own discussion about the topic. Eventually, someone would halt the debates, call order, and bring everyone back into one discussion group. This “superficial appearance of chaos,” as Alan Binder called it, was actually built on an “underlying logic” that was part of Clinton’s creative process. Robert Rubin also felt that Woodward’s depiction of the meetings as chaotic was overstated: “What might have looked like messy to outsiders [such as Woodward] was actually a process of deliberate open discussion, of smart, committed people engaging in debate as a way of getting to the best decision.” Paul Begala loved the process, saying, “people came in. They argued with passion. They stated their case. The other side stated its case. The President would go back and forth… I thought, that’s the way it ought to be.” Binder argues that the Clinton process was far superior, “because governments make bigger mistakes when the President is kept in a bubble and hears one opinion. 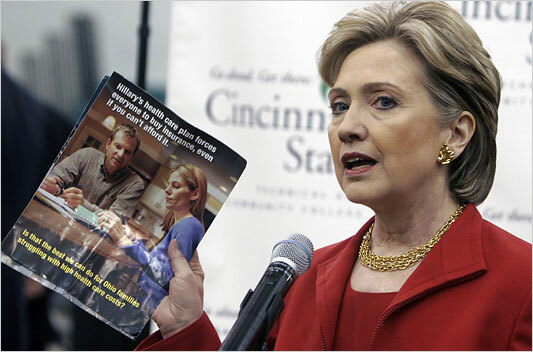 Bill Clinton was hearing lots of opinions, sorting out the arguments, and reaching decisions.” The “big mistakes” binder refers to have been evidenced over the last eight years of the Bush Administration. What I find amusing, therefore, is that President-elect Barack Obama, who criticized the Clinton White House and insisted that Hillary Clinton represented the past, is now following the Clinton blueprint. When President John F. Kennedy asked Robert McNamara to serve as his Secretary of Defense, McNamara demurred, saying “Mr. President, it’s absurd, I’m not qualified.” “Look, Bob,” Kennedy said, “I don’t think there’s any school for Presidents either.” Well, Obama seems to have attended the Clinton School for Presidents. In the last month or so, Obama has surrounded himself with Clinton’s advisors, including Bob Rubin, Larry Summers, Leon Panetta, Robert Reich, Rahm Emmanuel, and many others, including Tim Geithner, who worked with Rubin at the Treasury Department. Hillary Clinton, Bill Clinton’s closest and most trusted advisor (Clinton’s Robert Kennedy, if you will), will be Obama’s Secretary of State. Also amusing to me is the much talked about book Obama read by Doris Kearns Goodwin, Team of Rivals. The media has talked ad nauseam about how this book will influence his decision-making process. 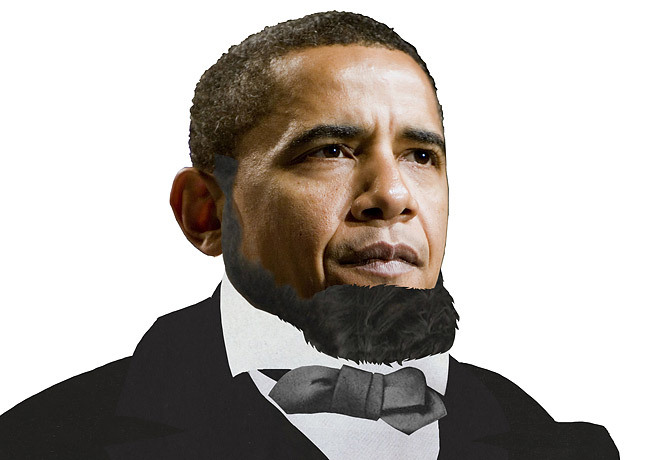 Abraham Lincoln, as Obama has done, appointed political rivals to key cabinet positions in order to have robust policy discussions in which divergent opinions were debated until the best decision was reached. Hmmm… sounds a lot like the Clinton process. This is, to be sure, a far better way of crafting policy than was used under the Bush regime, but, again, it is hardly any different from Clinton’s process. It is also, presumably, the way Hillary would have run her meetings. Though I am excited to see new leadership, and I am encouraged and inspired by Barack Obama, Bill Clinton is still my favorite. 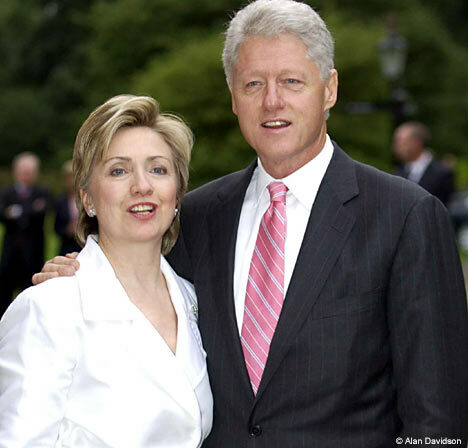 If Obama does replicate the Clinton years, you will hear little complaint from me. Yesterday, both Hamas and Israel brushed aside the UN Resolution calling for a cease-fire, and continued their violent campaigns. Israel’s Prime Minister Ehud Olmert openly disregarded Resolution 1860, calling it, “impractical.” Israel, instead of accepting the Resolution, struck 70 targets. Israel now is preparing to move into “Phase Three” of the invasion, which will require more ground troops going into more densely populated areas, risking higher civilian casualties. So far, since Operation Cast Lead was launched on Dec. 27th, 10 Israeli soldiers have been killed in action, while over 820 Gazans have been killed, and over 3,300 have been wounded. While each death is tragic, one must remember International Law, which dictates that the aggressor must keep the rule of Proportionality in mind. Mohammed Nazzal, a Senior Hamas Official, argued that, “Nobody consulted Hamas or talked to Hamas. Nobody put Hamas in the picture, and yet Hamas is required to accept it. This is unacceptable.” Hamas also wants to have Gaza’s border crossings open, to allow humanitarian aid and much needed supplies through. As of now, roughly one million people in Gaza are without electricity, and about 750,000 are without food or water. Gaza has a population of about 1.5 million people. In total, over the last two weeks, Hamas has fired about 500 rockets into southern Israel, which have killed four people. Most Americans, who know nothing of the middle-east conflict except for what little information they gleam from the news, tend to think of Palestinians as a monolith. They’re all Islamo-fascist terrorists who hate Israel and want nothing short of Israel’s destruction. Well, while idiotic talk-radio hosts (like Rush Limbaugh or Michael Savage) might believe that and their unthinking and uncritical audience accept their ignorant tirades as fact, the reality is that Palestinian society is complex, diverse, and, unfortunately, at this crucial juncture, fractured. There are Palestinians who are Muslim, Christian, and Jewish (though, in Gaza, 99.3% are Sunni Muslims); there are Palestinians who are strong advocates of peace, while there are others who insist on destroying Israel; there are Palestinians who live in Gaza, while others live in the West Bank or abroad. And the differences go on and on. Today’s climate in the middle-east is a direct result of President George W. Bush’s non-existent strategy for dealing with the peace process. Sure, he started a “road-map” for peace, but there was never any involvement from the administration, who felt that any peace-process was too “Clintonian,” therefore making it something they wanted nothing to do with. “If Clinton was for it, then it must be bad,” their logic went. From the outset, the Bush administration did everything in their power to undo everything Clinton had worked to achieve– beginning with the dissolution of the Middle-East Envoy position. Ari Fleischer, Bush’s first Press Secretary, essentially blamed Clinton for the Second Intifada, which began in 2001: “It is important to be careful in the region, to proceed at a pace that is achievable and doable, and not to raise people’s expectations falsely so high by trying to reach something that the parties cannot agree to themselves. Failure to reach that level created unmet expectations in the region and that resulted in violence.” In 2005, in an effort to “democratize” the middle-east, Bush fought hard for elections in the West Bank and Gaza, a move that was opposed by the Palestinian Authority. In a conference with Mahmoud Abbas in October 2005, Bush argued that, “The way forward must continue to include democratic elections. The upcoming elections for the Palestinian Legislative Council offer an opportunity to open the door to the next generation of Palestinian leaders. They’ll be responsible for building a peaceful and hopeful future for their country. 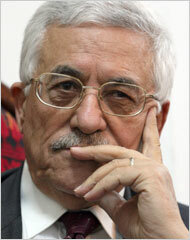 In the short-term, the Palestinian Authority must earn the confidence of its peoples, by holding elections and having a functioning government…” Unfortunately, as Bush had been warned, the danger of a Hamas victory could tilt the balance of power in the favor Hamas, who openly calls for the destruction of Israel and the creation of an Islamic theocracy in a Palestinian state (which would include Israel). Of those who opposed the election and the participation of Hamas in the elections was Ariel Sharon, who (at the time was PM) threatened not to support the process if Hamas was allowed to particiapte. Bush and Condoleeza Rice nonetheless allowed the election to continue with Hamas’ participation: “We would hope that the elections can go forward and that everyone will cooperate to make those elections go forward because elections are fundamental to the continued evolution and development of the Palestinian process,” Rice said. The election of Hamas came as a total surprise to the Bush Administration. For many, the election did not come as a surprise. Hamas had been steadily gaining support for decades, as the failure of Fatah to reach a political settlement with Israel dragged on. Hamas’ militant stance attracted many people who felt that the political options had been exhausted. Many Palestinians also viewed the Fatah party with disdain and mistrust, as it had been corrupt for so many years under Yasser Arafat. Moreover, during the election, Hamas had made many promises to the Palestinians in Gaza, such as: fighting corruption in government, creating more jobs, and boosting their dismal economy. Hamas had a message of social reform and change that the people desperately wanted to hear. In Gaza, 81% of people lived below the poverty line (earning less than $2.20 a day), unemployment somewhere around 50%, and they were growing weary of the Palestinian Authority’s security crackdown. Hamas, on the other hand, extolled the virtues of its candidates and their participation in charities that provided food and supplies to desperate Palestinians. Though the destruction of Israel was part of Hamas’ platform, the people who elected Hamas were, instead, giving a vote against the Fatah party and in favor of a party that argued for social change and reform. Though some people certainly may have supported that platform, most people in Gaza were delivering a protest vote. Polling a month after the election demonstrates this to be true, with 43% of those who voted for Hamas (the largest group) doing so in hopes of ending corruption. Polling a month after Hamas’s victory in Gaza demonstrated that two-thirds of Palestinians believed Hamas should “change its policy of rejecting Israel’s right to exist. Most also support a two-state solution to the Israeli-Palestinian conflict.” A poll conducted by the Jerusalem Media & Communication Center (JMCC) found that “58 percent of Palestinians said they favor the two-state solution, while 22 percent favor ‘a bi-national state on all of historic Palestine.’ Three percent said they want an Islamic state.” The poll also found that 66.3% of Palestinians wanted Hamas to continue negotiations with Israel, while 29.6 believed that they should not continue negotiations. Also, 51.7% believed that Hamas should end its military operations against Israel, while 51.5% also see those attacks as counter-productive to Palestinian interests. 43.8% found the operations politically justifiable, though that is a significant drop from 65.4% in June 2004. Both Hamas and Israel need to learn to live together. Despite their harsh criticisms of one another, they are very similar. Both believe that the land of Palestine/Israel belongs to their people, and are willing to use force to achieve their objectives, leaving innocent civilian populations to get the brunt of their violence. Meanwhile, the U.S. is preparing to send a large shipment of arms to Israel, a move U.S. officials deny is related to the conflict in Gaza. Air Force Lt. Col. Patrick Ryder, a Pentagon spokesman, said, “The delivery of ammunition is to a pre-positioned U.S. munitions stockpile in Israel in accordance with a congressionally authorized 1990 agreement between the U.S. and Israel.” Missiles that had been sent to Israel in early December, according to the Jerusalem Post, have been used in the Gaza invasion. Israel, for its part, has already warned people in Gaza to prepare themselves for escalation via the use of leaflets. Tanks and soldiers are going deeper and deeper into Gaza, and are now getting accused by the group Human Rights Watch of “using white-phosphorus munitions in Gaza and warned of the risk to Palestinian civilians.” Not only is white-phosphorous munitions likely to cause sever burns, but it is also likely to start fires. They do acknowledge, however, that it appeared that the IDF was using the munitions to “hide military operations ‘a permissible use in principle under international humanitarian law.‘” The use of white-phosphorous munitions has been decried by human rights groups, who argue that its use should be banned. The U.S. used the same material during a military operation in Iraq and has since defended its use as being perfectly legal. According to the Jerusalem Post, the UN is considering the use of international forces along the Gaza-Egypt border, where Israel claims Hamas is smuggling weapons into Gaza. The UN plan also would reinstate the PA’s jurisdiction over the Gaza Strip. This comes at a time when Mahmoud Abbas, whose term has ended, has insisted that he will not step down until there are parliamentary and presidential elections, as required by the PA’s constitution. His aides have indicated that he plans to create an emergency government, which will extend his term for one year. And finally, a news report from the Gaurdian has been denied by President-elect Barack Obama’s team. The report indicated that Obama would hold negotiations with Hamas at lower levels, opting for clandestine meetings over direct talks: “The Guardian has spoken to three ­people with knowledge of the discussions in the Obama camp. There is no talk of Obama approving direct diplomatic negotiations with Hamas early on, but he is being urged by advisers to initiate low-level or clandestine approaches, and there is growing recognition in Washington that the policy of ostracising Hamas is counter-productive.” So, according to Obama’s spokesperson, he would indeed continue Bush’s policy of isolating Hamas. Brooke Anderson, Obama’s transition team’s chief national security spokeswoman, said that he “has repeatedly stated that he believes that Hamas is a terrorist organization dedicated to Israel’s destruction, and that we should not deal with them until they recognize Israel, renounce violence, and abide by past agreements.” Even Colin Powell, who endorsed Obama in the final weeks of the election, has argued that Hamas can no longer be isolated if peace is to be achieved– it must be dealt with. * Security mechanisms that address Israeli concerns while respecting Palestinian sovereignty. This, of course, was not to be. If President-elect Obama hopes to bring real peace and security to the U.S., and to the middle-east, he would do well to heed their letter. As day 14 draws to a close, world pressure to stop the violence in Gaza is mounting. What is occurring, on the ground, is a humanitarian crisis– one that journalists are unable to report. The information that leaks out comes from Palestinians in Gaza and from what Israeli officials report. The UN, nonetheless, fears an escalation of the crisis and is gravely concerned about the impact of the violence on civilians. 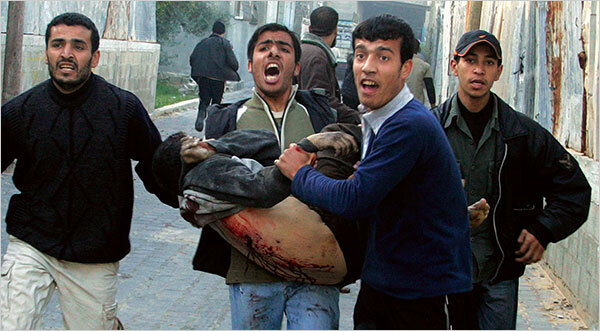 Thus far over 770 Palestinians have been killed and over 3,100 have been wounded. Of those killed, 219 were children and 89 were women. Since the invasion, 14 Israelis have been killed. Earlier tonight, the UN overwhelmingly approved of a Security Council resolution– only the U.S. abstained– which calls on both sides to agree to a truce brokered by Egypt, as well as allowing for the passage of much needed supplies into Gaza. The ultimate aim of the resolution is the removal of Israeli forces from Gaza. The U.S. has continued to stand by Israel and its “right” to defend itself with an invasion of Gaza. In fact, the House of Representatives, according to Nancy Pelosi, is going to vote on a non-binding resolution which will support Israel’s invasion. Israeli officials, likewise, have continued to blame the invasion on the Palestinians and Hamas, who have been firing rockets into southern Israel. As the UN Resolution passed, Secretary of State Condoleeza Rice still maintained that the best option was the cease-fire plan drawn-up by France and Israel. Despite the efforts of Egyptian President Hosni Mubarak and Nicolas Sarkozy, neither Hamas nor Israel seem interested in accepting a truce. Hamas, strangely, feels that it has the upper-hand, though the people are suffering tremendously, while Israel (who does have the upper-hand) sees no point in backing down. In fact, Ehud Olmert has promised a “war to the bitter end”, and tomorrow the Israeli Cabinet will decide whether or not to accept the UN’s resolution, and whether or not they should move their war plans to “phase three”— sending more ground troops into densely populated areas. How much do you want to bet that they refuse to adhere to the UN Resolution? Adding to fears that this war could escalate to include Lebanon, Israel launched five rockets into Lebanon, in supposed retaliation for an attack from Hezbollah. Four Katyusha rockets, to be sure, landed in the northern Israeli town of Nahariyah thursday morning, but the question of “who” has yet to be determined. Both Hezbollah and Hamas deny any involvement or prior knowledge of the attack, despite claims from Israeli officials. 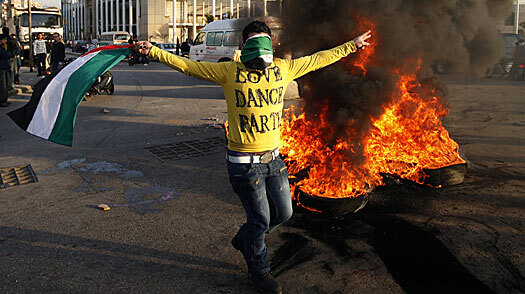 The Lebanese government, to the satisfaction of the Israelis, condemned the attacks, as well. Raafat Mora, a Hamas spokesman, denied the involvement of Hamas: “Hamas is pursuing its combat inside Palestine and our principle is not to use any other Arab soil to respond to the occupation. This is our firm policy.” The attack, I suspect, is probably a result of the call from Ayman al-Zawahiri, who called upon Muslims to fight Israel. At any rate, Israel’s retaliatory rockets were fired into an unoccupied valley, in order to prevent further retaliation from militants within Lebanon. The Red Cross is also growing increasingly agitated with Israel’s failure to respond to the humanitarian crisis. The International Red Cross released a statement accusing Israel of not allowing aid workers access to wounded people in certain areas. When they were finally allowed access to an area that they had been attempting to enter for several days, they found“four small children next to their dead mothers in one of the houses. They were too weak to stand up on their own. One man was also found alive, too weak to stand up… In all, there were at least 12 corpses lying on mattresses” in one of the houses. According the IRC’s statement, Israeli forces forced them to leave. Pierre Wettach, ICRC head for Israel and the Palestinian territories, said, “The Israeli military must have been aware of the situation but did not assist the wounded – neither did they make it possible for us or the Palestinian Red Crescent to assist the wounded.” The Red Cross has decided to restrict its movements within Gaza city after one of its convoys had been attacked by Israeli forces in Netzarim. Though nobody was killed, one driver was injured. 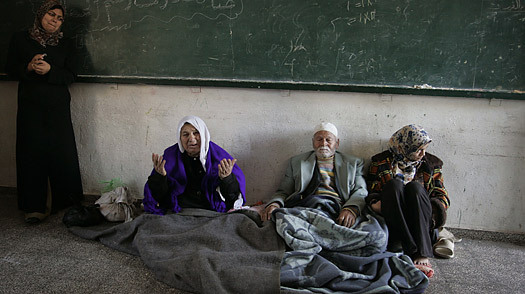 The BBC also reported an incident on January 5, 2009 in Zeitoun, which is being investigated by the UN Office for the Coordination of Humanitarian Affairs (OCHA), in which Israeli soldiers rounded up 110 Palestinians (half of whom were children), moved them into a single shelter, and then told them not to move. 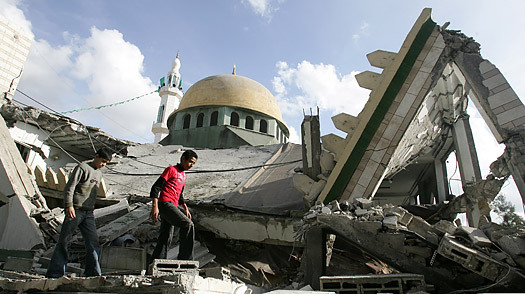 According to OCHA, within 24 hours Israeli forces shelled the building, killing approximately 30 people. An OCHA spokesperson called it the “gravest incident” since the beginning of the invasion. Those who survived then had to walk over two miles to receive medical attention. In all, according to the World Health Organization, 21 Palestinian medical workers have been killed and 30 have been wounded. I think the word proportionality comes to mind. Israel, like any other nation, has a right to defend itself. The issue is proportionality. While Hamas militants’ violence is horrible and cruel, and must stop, it in no way justifies the large scale invasion that Israel has undertaken. Civilians– particularly women and children– who have done nothing wrong at all are taking the brunt of the assault. No argument (even the irrational “human shield” argument) can account for the level of violence. Air strikes, home demolitions, destruction of infrastructure, tank firings, and ground troop movements, are not proportionate to the rocket fire from Hamas militants (which are limited in range and effectiveness). International Humanitarian law demands that armies must distinguish between civilian and military targets, but that is not happening in Gaza. Where the risk to civilian populations outweigh the military goal of destroying a military target, international humanitarian law dictates that the military operation cannot be carried out. Instead, they must find alternate means of taking out the military target. Israeli forces must also remember that, since Egypt has closed its border with Gaza and there is no escaping into Israel, the people in Gaza really have no place to flee. Their only option, really, is to remain in their homes, where they have no electricity, water, food, or other supplies, and they have little access to humanitarian or medical assistance. Hospitals are being flooded with victims, but doctors are overworked and are running low on supplies. Some doctors in Gaza are estimating that 20-30% of their patients are children. While Israel is certainly to blame for much of the destruction in Gaza, Hamas also carried a lot of blame. Like many governments, they fail to heed the wishes of their people, opting to follow their own interests. Hamas is no different. The former Prime Minister of Gaza, Ismail Haniya, stated that, “The Israeli aggression will not achieve its goals even if it fully destroys Gaza strip and leaves no Palestinian alive. Hamas will not give in.” Essentially, he’s promising the self-immolation of a people who do not want to be wiped from the face of the earth. The leaders of Hamas are sacrificing all the people of Gaza for their own self-interests. What Hamas should do is halt the firing of rockets into Israel– not only because it is the right and moral thing to do, but also because it would then put the ball in Israel’s court. Israeli officials all along have maintained that this invasion is about Hamas militants firing rockets into Israel. So, if the rockets stop falling on Israel, wouldn’t Israel lose its ability to maintain the siege? Either they would leave Gaza, or they would continue the siege, suggesting other motives. Seems to be a no-brainer to me. 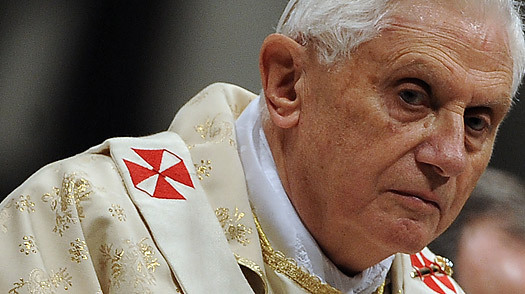 We are astounded to hear from a spiritual dignitary words that are so far removed from truth and dignity.” Though he does eventually intend to visit the Holy Land, his visit, previously a voyage of faith, may now become a voyage in search of peace. We are now at the end of day 12 of the Israeli invasion of Gaza. Remember that the June 1967 war lasted only six days. In that war, Israel was able to defeat Egypt, Jordan, Syria, and a few other Arab states that contributed some troops to the war against Israel. Israel’s quick victory demonstrated to the world, and to the United States in particular, that they were mightier than they were in 1948. The victory not only crushed Arab Nationalism and unity, smashed Nasser’s political relevance, and gained them huge territorial gains, but it also earned them the support of the U.S., who wished to use Israel as a bulwark against any possible Soviet Union incursion into the middle-east. Israel took the Sinai peninsula, the Golan Heights, and they also took control over the Gaza Strip, the West Bank, and East Jerusalem. 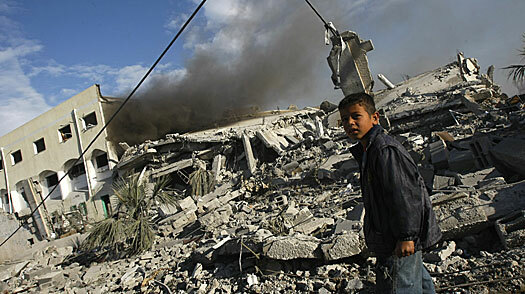 This war and the ongoing occupation has continued to influence the conflict in the region. In the last few days, the violence in Gaza has escalated. An Israeli attack on a school in Gaza where the UN was sheltering about 350 civilians has resulted in the deaths of 40 people, injuring dozens more. This has been the third attack on schools in Gaza in the last twelve days. Most of those killed were civilians, according to paramedics, though Israel maintains that Hamas militants were using the school to fire rockets into Israel. Israel Defense Forces spokesman Brig. General Avi Benayahu said, “We face a very delicate situation where the Hamas is using the citizens of Gaza as a protective vest.” The UN will begin investigations into the school bombing. John Ging, director of the UN Relief and Works Agency (UNRWA), said that the UN schools were all “clearly marked” with UN flags and that Israel had been given the global positioning coordinates of all school locations. Ging went on to say that, “We’re demanding full accountability in accordance with international law and the duty of care that the parties to the conflict are obliged to adhere to.” He also denied Israeli assertions that Hamas militants were using the school, saying, “So far we’ve not had violations by militants of our facilities.” He insisted that the UN had vetted all civilians requesting shelter. There have also been some reports that Israel has made some crossings into southern Lebanon, sparking fears that Israel might extend its war into Lebanon. There’s speculation that this might be a way of provoking Hezbollah, who has already promised retaliation for Israel’s assassination of a Hamas commander, Imad Mughniyeh. It is doubtful, however, that Israel would want to open a second front with Lebanon during the current conflict. Israel is still smarting from its failed attempt to crush Hezbollah, a radical/militant Shiite group in Lebanon with tremendous influence in the region (and backed by Iran), in July 2006. 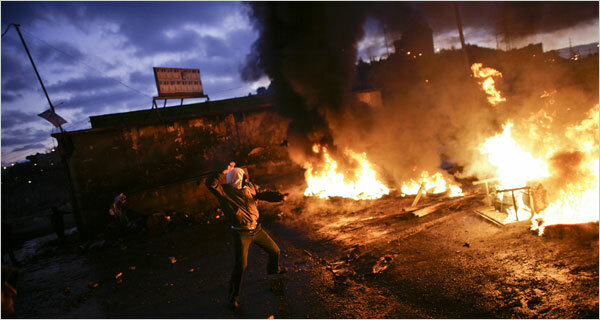 The incursions into southern Lebanon, more than likely, was Israel’s way of warning Hezbollah to stay out of the fray. Hezbollah, for the most part, has been staging protests against Israel’s invasion, Egypt, and the U.S. The July 2006 invasion of Lebanon was also Israeli Prime Minister Ehud Olmert’s political Waterloo. He is now being forced out of office and elections are being held this February for a replacement. Egyptian President Hosni Mubarak, along with French President Nicolas Sarkozy, has again put forward a cease-fire plan, which both men hope Hamas and Israel will take. Though many in the UN applaud this plan, Condoleeza Rice, on behalf of the U.S., has not supported the plan: “We need urgently to conclude a cease-fire that can endure and that can bring real security. This would begin a period of true calm that includes an end to rocket, mortar and other attacks on Israelis and allows for the cessation of Israel’s military offensive,” she said. The current plan, she fears, would lead only to a return to the status-quo. However, after a meeting with Sarkozy, Syrian President Bashar Al-Assad has announced that Hamas is willing to accept the terms of the truce, saying, “They are ready [to make a deal]. They were ready, they are ready.” The Russian Foreign Ministry has also confirmed that Hamas is willing to agree to a cease-fire, after having met with Hamas’ political leader Khaled Mashaal. According to Mashaal, they would stop the rocket firings if Israel would lift the 18-month blockade that has crippled Gaza’s access to basic neccessities, like food, water, and medical supplies. However, Egypt, particularly Mubarak, has earned the scorn of Arabs across the region. They view him as someone who has colluded with the enemy at the expense of the Palestinian people. This attitude towards Egypt goes as far back as the U.S. brokered Camp David Accords of 1978, when Egypt and Israel signed a peace agreement. They also are angered by his refusal to open the Egyptian border with Gaza to let refugees out and supplies in. Though he has “slammed” Israel’s invasion of Gaza, he blames the invasion of Israel on the failure of the Hamas government to renew the truce, which expired December 19, 2008. He also criticized groups such as Hezbollah, who, he argues, the “plight of the Palestinian people” for “political capital.” Because Egypt is the only “Arab” (though technically Egypt is in Africa) country to border Gaza, many Arabs feel Egypt has an obligation to protect and support the people of Gaza in this desperate time. They feel that Egypt has failed in that regard. To complicate matters, the spokesman and deputy chief of Al Qaeda, Ayman al-Zawahiri, released a ten minute taped message blasting Egypt, the U.S., and President-elect Barack Obama. He attacked Mubarak as a “traitor” and a “partner” in the “siege and killing.” “At the time when Israeli planes drop their bombs from the air, he closes the borders with his forces so that the plan of the killing of believers in Gaza is fulfilled,” al-Zawahiri said of Mubarak. Al-Zawahirir also blamed Barack Obama for the conflict in Gaza, adding that the conflict was a “gift.” He labeled the attacks a “crusade against Islam and Muslims” and blasted Obama for his silence and his inaction. Al-Zawahiri also encouraged Muslims everywhere to strike back at the aggressors “everywhere.” The recording was posted on several militant Islamic websites, along with a picture of him holding a gun. Osama bin Laden, the 9/11 mastermind, has not been heard from in quite some time, prompting some in the intelligence community to wonder about his health, or whether or not he is even alive. Barack Obama, who is adverse to drama, has had to deal with the Blagojevich scandal and the subsequent attempt to appoint Roland Burris to Obama’s vacant senate seat, the stepping down of Bill Richardson as Obama’s Commerce Secretary nominee, Diane Feinstein’s public criticism of Obama’s selection of Leon Panetta to head the CIA, coming up with a stimulus package, determine his policy on cap-and-trade, plan for tax cuts, and now he has to brace himself for the conflict in Gaza. In the taped recording, al-Zawahiri criticized Obama for his efforts to portray himself as “the savior who will come and change American policy” during the U.S. election but is now “killing your brothers and sisters in Gaza without mercy or even pity.” Obama issued a statement in response to al-Zawahiri: “Starting at the beginning of our administration, we are going to engage effectively and consistently to try to resolve the conflicts that exist in the Middle East.” He also added that he was “deeply concerned” about the loss of life in Gaza. Al-Zawahiri is prematurely blaming Obama for the violence in Gaza, a sign that they did expect Obama to be more proactive when it came to the middle-east. It might seem a bit counter-intuitive, but it could be a sign that the war on terror is going to change as Bush leaves office. On Monday, Israeli Foreign Minister Tzipi Livni told a delegation of European foreign ministers that “Before the military operation, the equation was that Hamas targets Israelis whenever it likes, and Israel shows restraint… This is not going to be [any] longer the equation in this region. When Israel is targeted, Israel is going to retaliate.” This would come as a surprise to many in experts in the region who have criticized Israel’s long military occupation of the Palestinian territories. 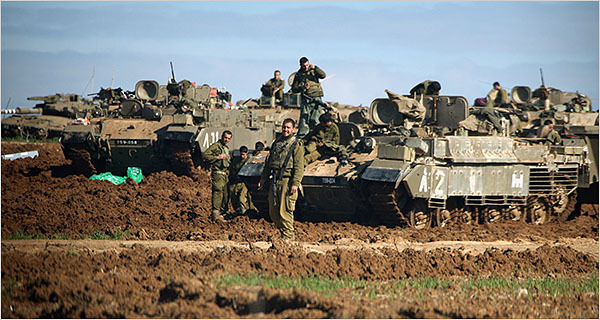 On Saturday, January 3, 2009, Israel launched its ground offensive into Gaza. There had been talks of establishing a truce: Hamas wants the 18-month blockade lifted; Israel wants the rocket firings to stop.The failure of Hamas militants and Israeli leaders to halt the violence has precluded any such progress in that direction. 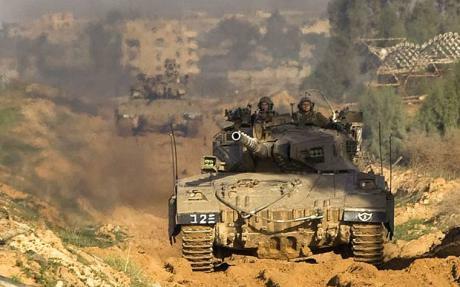 In the meantime, tanks and ground forces entered Gaza, quickly taking Gaza City. 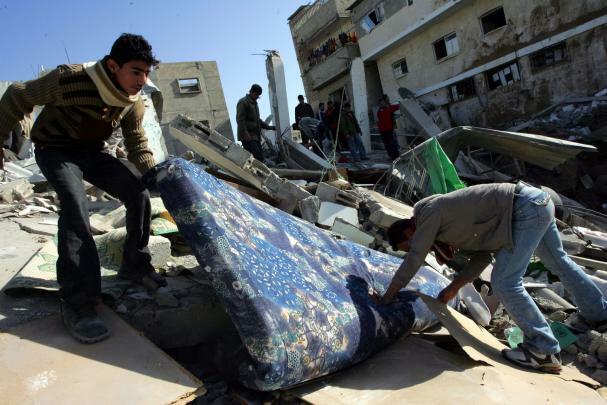 Suspected militant sites have been shelled and most of Gaza’s infrastructure is in shambles. Israeli military officials have also claimed to be striking tunnels (used by Hamas for smuggling weapons), and weapon caches. 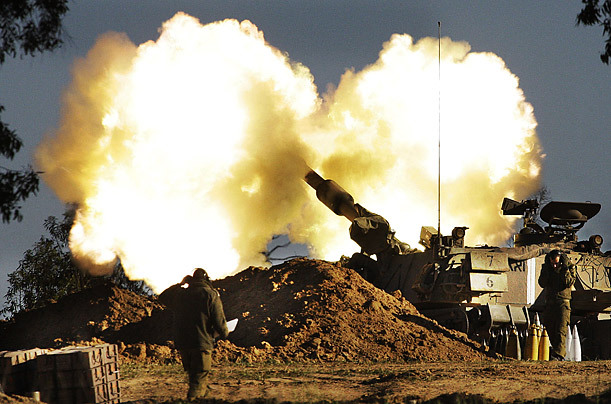 Hamas has fought back by launching rockets into southern Israel. 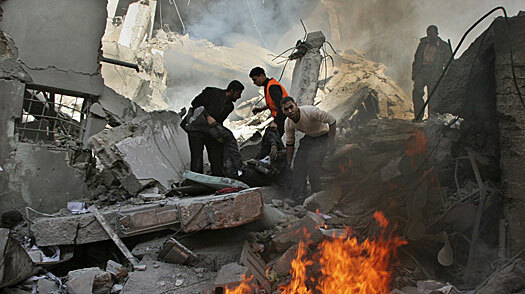 Three Israeli civilians have been killed, and many buildings, including schools, have been destroyed by Hamas rockets. Since the Israeli ground invasion, two Israeli soldiers have been killed. 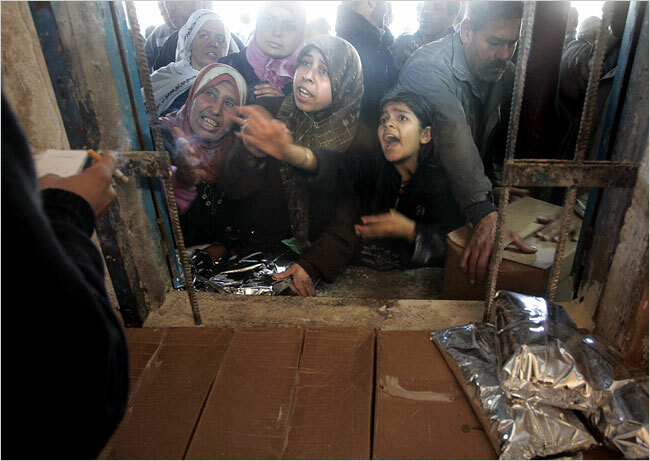 Despite Israel’s claim that they are not targeting civilians, the Palestinians in Gaza have suffered tremendously. 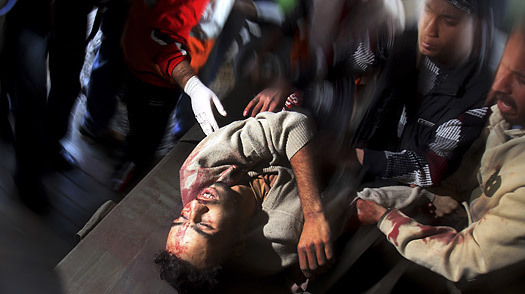 Since the begining of the Israeli onslaught in Gaza, over 530 Palestinians have been killed– 82 since Saturday. Of that, over 100 deaths have been women and children. In addition to the deaths, over 2,600 people have been injured, and thousands more have fled their homes in order to escape the violence. Humanitarian agencies, such as the UNRWA and UN’s World Food Program, have had difficulty trying to bring food and water to civilians caught up in the violence. Many civilians are stuck in their homes without running water, without electricity, and a dwindling food supply, which they are unable to replenish. In all of the Gaza Strip, there are only two bakeries still open, and there are long lines of people trying to get what little food they can for their families. Hospitals are being overwhelmed and the few medical supplies that they have are being diminished. Some doctors on the ground insist that the body count is much higher, but they cannot get an accurate count because the conflict presents grave danger to ambulances and rescue crews. One ambulance, reportedly, was shelled by an Israeli tank as it was evacuating victims. One paramedic was killed while the other lost his foot. So, what’s their aim? Well, according to Israeli officials, they want all rocket firings into Israel to stop. But Israel also wants to topple the Hamas regime, which does not recognize Israel’s right to exist. They are attempting to dismantle their weapons supplies, while at the same time castrate their political power. Also, remember that Israel has elections in February. They certainly aren’t forgetting. This is not the whole story, however: right-wing extremists, who have been in control of Israel’s government since its inception, belive that Gaza (and the West Bank) is rightfully theirs, according to God’s promise. Little by little, there is the hope that they will leave the region altogether, assimilate into neighboring Arab countries, and leave all of Palestine to Israel. Settlers continue to build on Palestinian land, homes are demolished, and Palestinian land continues to be taken. What Israel needs to remember is that the more violence it spreads, the more deaths that are caused, the longer the suffering occurs, the more they are pushing the population of Gaza into the Hamas corner. The violence of the last ten days, or so, stems from the failure of both sides to adhere to the terms of the Egyptian brokered truce, which expired December 19, 2008. However, one must recall that Hamas abided by the terms of the cease-fire until Israel’s November 4, 2008 air strike into Gaza that killed five people and wounded many more. As always happens in this region, tensions and violence escalated through a series of retaliatory strikes. French President Nicolas Sarkozy, who has been pressuring both sides to accept a truce, is now in the middle-east. He made stops in Egypt, the West Bank, and Israel today. He met with Palestinian President Mahmoud Abbas in Ramallah, where he gave a press conference condemning both Hamas and Israel. Meanwhile, U.S. UN Ambassador Zalmay Khalilzad has been instructed by State Department Officials (probably including Condoleeza Rice) to torpedo any efforts by the Arabs to request assistance from the UN Security Council. While French President Sarkozy has been even-handed in his criticism, President George W. Bush has continued his unflinching support for Israel: “I understand Israel’s desire to protect itself. The situation now taking place in Gaza was caused by Hamas.” President-elect Obama has been silent on the issue of Gaza. He has continued his mantra: “There is one President at a time.” True, but, like Representative Barney Frank, I think he “seriously overestimates the number of Presidents we have.” I think that since he is going to be President in… 15 days, it matters what he thinks. Since the Bush camp has decided to sit on their hands, he should at least voice an opinion. Perhaps he does not want to express an opinion that is at odds with the current President, thus undermining anything Bush says, but I think that the violence is such that it requires a response.